The Hall of Fame photos were nice, but it’s been too long since I’ve shared some “never-before-seen” UCLA Cheer photos, so tonight I am breaking the Streak of bleakness — ala the National League. But before I unfurl the new ten of 10’s, there are are few things that occurred over the last few weeks — while I was compiling the Halls of Fame — that deserve comment. Some you’d have to be in a coma to have missed, but others you might not be aware of. It all begins with “The Decision,” ESPN’s LeBron James Made-for-TV Special. You’ve already seen a dozen critiques of the overblown media circus, and they are all correct… but I am not going to join in with the same contempt. The sole fact that the ad revenue from the show went directly to the Boy & Girls Clubs Charity made the whole thing “untouchable” from a critic’s point of view. I think if a guy wants to act like an egotistical “God’s Gift,” while generating massive funds to keep kids off drugs and out of gangs, that’s okay with me. Like I said, all the specific critiques were NOT wrong: The presentation and the hype were ridiculous, the whole thing was a LIVE knife in the heart to the entire City of Cleveland, and Interviewer Jim Gray was intolerable, asking the exact same question FIVE times in a ten-minute span. But if it indirectly lowers Gang enrollment, I’m still okay with it. Of course, I wasn’t a Cavaliers fan. Just to make it clear: LeBron has every RIGHT to change teams, and does not OWE Cleveland more than the 7 years that he has already given them. It is simply about winning a Title, and keeping himself from being the Best in History to Never Win. If he could have gotten Dwyane Wade And Chris Bosh to sign with Cleveland, LeBron would have stayed put. But going to Miami to form a Power Trio is not the issue — It’s the low-class WAY in which he strung Cleveland along, and then broke their hearts on a glitzy TV show. Not even the Cleveland Owner, who went ballistic afterwards and got fined $100,000, knew that LeBron was going to pick Miami. There is a chance that LeBron’s new team — already the Favorite to win the Championship this coming year — might have a Bruin on it. On Friday, Bruin Matt Barnes is expected to announce where he will play this year. It is supposedly down to the Heat, the Mavericks, staying with Orlando, or possibly… the Lakers. Barnes would become the ONLY Bruin on the Lakers, since Jordan Farmar has left, signing a 3-year deal with the New Jersey Nets. Instead of re-signing Farmar, the Lakers spent less to re-sign Derek Fisher, and also added ex-Clipper Steve Blake. If the Lakers snag Barnes away from the Heat, the Oddsmakers may have to nudge the Lakers over Miami, back into the Favored position. James and Bosh aren’t the only two highly sought-after athletes who have bailed on their teams to go to Miami: Former usc commit Seantrel Henderson’s “re-recruitment” by Lane Kiffin has failed, ending with Henderson’s decision to become a Miami Hurricane. Speculation remains that it wasn’t the sanctions that scared him away, it was Kiffin’s b.s. guarantees of “no sanctions” that did the trick. And speaking of b.s., the ESPY’s were on Wednesday night, and just like “The Decision,” the ESPY’s are nothing more than an Industry leader patting itself on the back. HOWEVER, this year’s broadcast had the benefit of Seth Meyers and the SNL Weekend Update writers working for them. The Opening Monologue was nothing short of hilarious, skewering everyone in the year’s Sports news, including Reggie Bush, who looked very uncomfortable when Meyers said that the ESPY’s were the coming together of Sports and Entertainment, like in a Kardashian Sister’s bedroom. And speaking of envy, I don’t envy Torii Hunter, who had two chances to be the Hometown Hero in the All-Star game at Anaheim Stadium, but did not come through. It would have really been a storybook ending in the shadow of Disneyland, but Hunter looked pretty Dopey going down in his final attempt. To his credit, he was a good sport and gave a decent post-game interview immediately after the loss, AND, he has been an awesome Angel for a while, both Offensively and Defensively. With a little luck, Hunter will get a chance to redeem himself, on an even bigger stage, in October. Of course, the Rangers, with newly-acquired Ace Cliff Lee, might have something to say about that, and could easily block the Angels’ dreams. And finally, speaking of blocking dreams: I am proud to report that the UCLA Athletic Program is in good hands when it comes to the Sports Information Office, especially in regards to communication, responsiveness, and most-importantly, keeping the riff-raff off the sidelines. I had been told that Coach Neuheisel wanted the most popular Bruin Bloggers — of which I happen to be one — to receive UCLA Media Credentials. I believe that to mean that he wanted bloggers to be granted access to Press Conferences, Press Releases, and sideline passes for photographic purposes. He even suggested whom to contact: None other than Sports Information Director Marc Dellins. So I e-mailed Mr. Dellins with the request. And even though Mr. Dellins was Officially on Vacation, he responded to my query almost instantaneously. He was unaware of Coach Neuheisel’s desire about bloggers, and kindly explained to me that only the sites attached to National Networks like ESPN and Fox — as Scout and Rivals are- are entitled to credentials. Also, UCLA would not necessarily be comfortable officially acknowledging a site with such a prominent anti-usc Title and slant. The important thing is that Marc replied immediately, and personally. He gave me a logical rationale for turning me down, and even showed concern for my feelings, in the way he so gingerly explained his reasoning. I know that I use sarcasm a lot, but I am NOT doing so now: Marc did the right thing, in the right way. I’m disappointed, sure, but at least I know that the Bruins have a competent S.I.D. running things, which is new peace of mind that I didn’t have prior to this experience. Speaking of peace of mind, here are 10 new photos recommended to help you find your Peace. 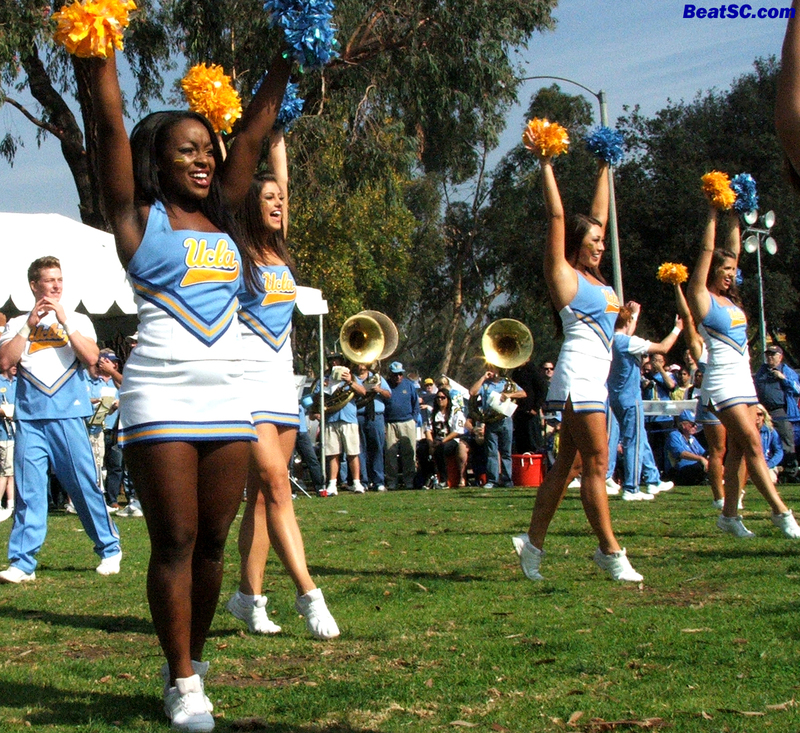 "DANCE, RANTS, NO CHANCE TO ADVANCE" was published on July 16th, 2010 and is listed in Blue & Gold News, News from the Dark Side, Non-Rivalry News, UCLA/usc/Cheerleader Photos. 1. What do you think of the idea floating around that Lebron passed up any chance of being ‘The Best’ by signing up with Miami for a secondary role on what already is Wade’s Team? 2. Along the same vein, what do you think of the idea that Lebron with his performance in the playoffs and now going off to play with Wade has proven himself to be more a Julius Erving than an MJ or Kobe? Great pics as usual T-H! Keep bleeding the Blue and Gold! GO BRUINS!